A couple of days ago, Dimitri published a blog post, Analyzing Percona’s TPCC-like Workload on MySQL 5.5, which wasÂ a response to my post, MySQL 5.5.8 and Percona Server: being adaptive. I will refer to Dimitri’s article as article . As always, Dimitri has provided aÂ very detailed andÂ thoughtful article, and I strongly recommend reading if you want to understand how InnoDB works. In his post, Dimitri questioned some of my conclusions, so I decided to take a more detailed lookÂ at my findings. Let me show you my results. Article  recommends using theÂ innodb_max_dirty_pages_pct and innodb_io_capacity parameters to get stable throughput in MySQL 5.5.8. Let’s see what we can do with them. Article Â also advises that innodb_log_file_size is not important for stable throughput. For my tests, I again used the Cisco UCS C250 box with 346GB of RAM , and I ran the tpcc-mysql benchmark with 500W (about 50GB of data) on the FusionIO 160GB SLC card. ForÂ innodb_buffer_pool_size IÂ used 26GB to represent about aÂ 1/2 ratio of buffer_pool_size to data. For the initial tests, IÂ used MySQL 5.5.8 (the tar.gz binary from dev.mysql.com), and for the other tests I used Percona Server based on 5.5.8. Addressing a complaint to my previous post, I am sharing the percona-server-5.5.8.tar.gz I used for testing, but please note: It is very pre-beta and should not be used in production. You can download it from our TESTING area. benchmark throughput – This is New Order Transactions per 10 seconds.
. This is the exact formula that InnoDB uses internally to estimate current innodb_dirty_pages_pct. from SHOW ENGINE INNODB STATUS. Here are the InnoDB settings for the initial run. Later I will changeÂ them in searching for optimal values. Please note that initially I used the default value forÂ innodb_max_dirty_pages_pct, which is 75, and the default value forÂ innodb_io_capacity, which is 200. I also enabled innodb_doublewrite. AsÂ will appear later, it is quite a critical parameter. Let me explain the second graph a little. 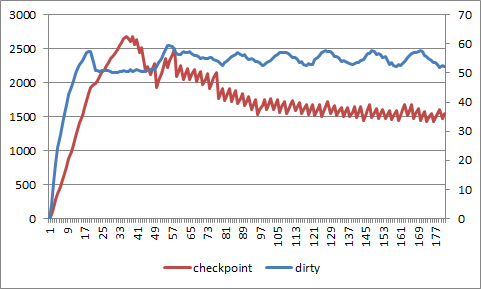 I put checkpoint age and dirty pages percentage on the same graph to show the relationship between them. 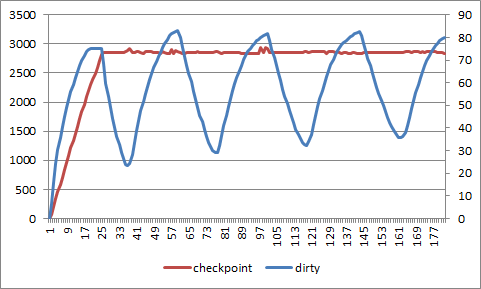 Checkpoint age is shown by the red line, using the left Y-axis.Â Dirty pages are shown by the blue line,Â using the rightÂ Y-axis. 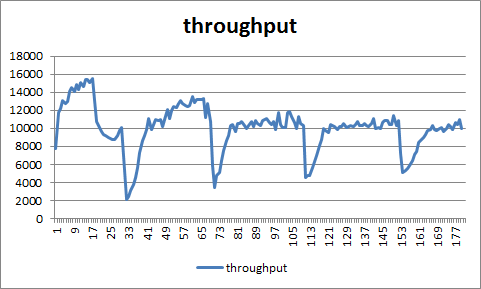 As expected, throughput jumps up and down. 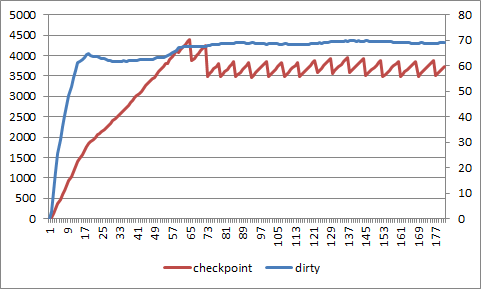 Checkpoint age is stable and is about 2854.02 MB. 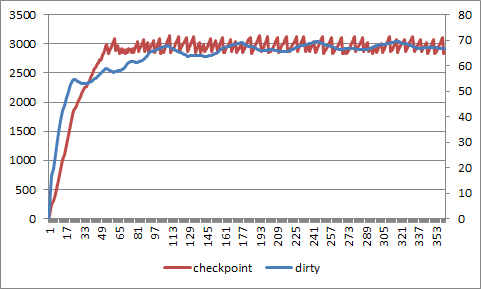 Checkpoint age is the limiting factor here, as InnoDB tries to keep the checkpoint age within 3/4 of the limit of the total log size (total size is 2000MB*2). 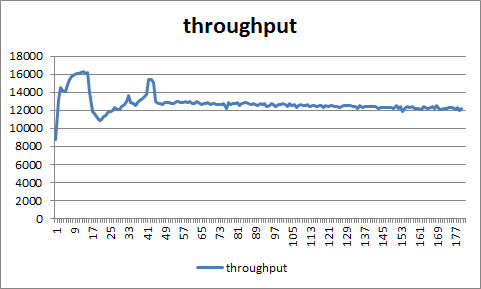 The 15-minute average throughput is 59922.8 NOTPM. Okay, now following the advice in article , we will try to limit the percentage of dirty pages and increase I/O capacity. So, I will set innodb_max_dirty_pages_pct=50 and innodb_io_capacity=20000. 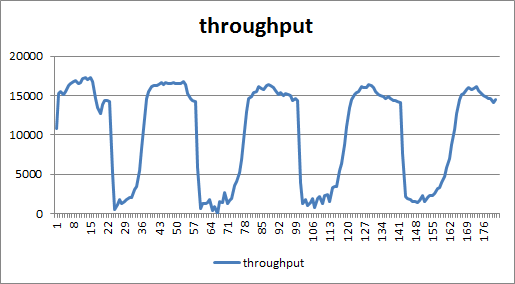 As we see, throughput is getting into better shape, but is far from being a straightÂ line. 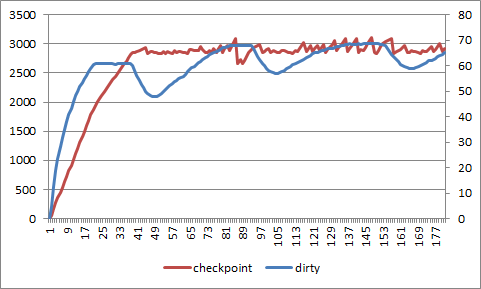 If we lookÂ at theÂ checkpoint age/dirty pages graph, we see that the dirty pages percentage is not respected, and is getting up to 70%. And again we see the limiting factor isÂ checkpoint age,Â which is getting up to 3000MB during the run. The 15-minute average result for this test is 41257.6 NOTPM. So, it seems we are not getting the stable result of article , and the difference is theÂ doublewrite area. Doublewrite activity actually adds significant I/O activity. Basically, it doubles the amount of writes :), as youÂ see fromÂ its name. So, let’s see what result we have when we disable doublewrite; that is, set innodb_doublewrite=0. 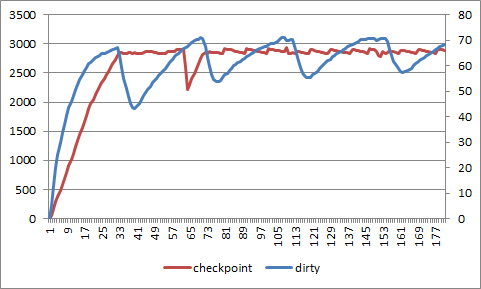 Now, although throughput is not a perfect line, we see a totally different picture for dirty pages and checkpoint age. The dirty page maximum of 50% is still not respected by InnoDB, but the checkpoint age drops far below the 3000MB line. It is now on about theÂ 1500MB line. The 15-minute average result for this test is 63898.13 NOTPM. That is, by disabling the doublewrite area, we improved the result 1.55x times. As it seems hard for InnoDB to keep 50% dirty pages, let’s try 60%. Here is the run with innodb_max_dirty_pages_pct=60. 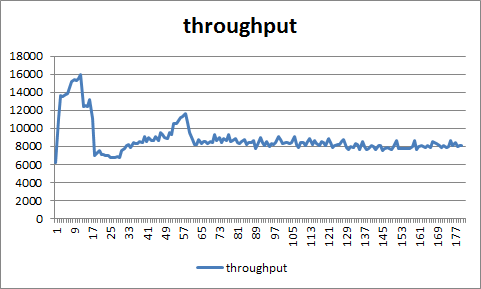 Okay, now we finallyÂ see throughput more or less flat. 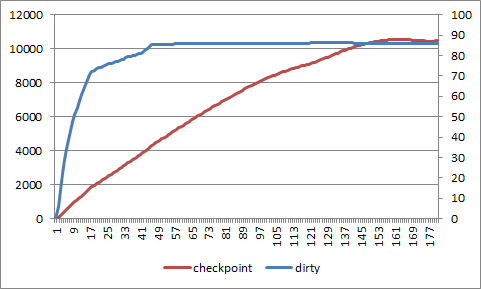 The dirty page percentage is keptÂ at theÂ 60% level, and checkpoint age is at the 2000MB level; that is, not bounded by innodb_log_file_size. The 15-minute average result for this test is 64501.33 NOTPM. But we still have DOUBLEWRITE=OFF. Since now we are limited by innodb_max_dirty_pages_pct, what will be the result if we try to increase it to 70% ? It seems 70%Â is too big, and now we again hit the limit set by innodb_log_file_size. The 15-minute average result for this test is 57620.6 NOTPM. Let me summarize so far. 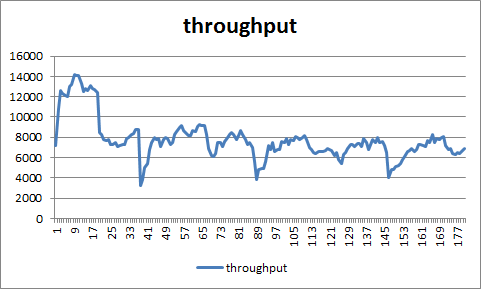 With innodb_doublewrite disabled, we have stable throughput only with innodb_max_dirty_pages_pct=60. Setting this value to 50 or 70 gives us dips in throughput, thoughÂ for different reasons. In the first case, InnoDB is unable toÂ maintain theÂ 50% level; in the second we are limited by the capacity of REDO logs. So, what do we get if weÂ again enableÂ innodb_doublewrite, but we now setÂ innodb_max_dirty_pages_pct=60? This is a bummer. 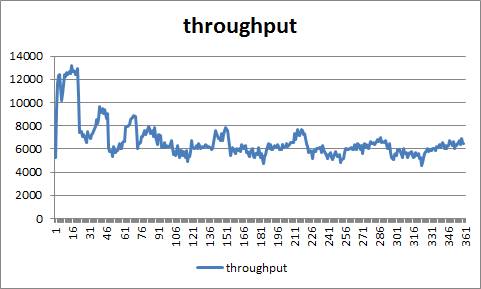 Throughput again jumps up and down. The dirty pages percentage is not respected, and InnoDB is not able toÂ maintain it. And checkpoint age is back to 3000MB and again limited by innodb_log_file_size. The 15-minute average result is 37509.73 NOTPM. I can’t say if the resullt should be considered stable. There are still a lot of variations. The 15-minute average result is 37039.73 NOTPM. Let’s tryÂ an even largerÂ decrease, settingÂ innodb_max_dirty_pages_pct=15. 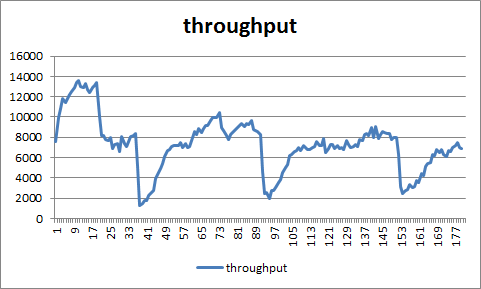 This seems to be the most stable line I can get with MySQL 5.5.8. The 15-minute average result is 37235.06 NOTPM. This allows me to draw a conclusion which partially concurs with the conclusion in article . My conclusion is: With doublewrite enabled,Â you can get a more or less stable lineÂ in MySQL 5.5.8 by tuning innodb_max_dirty_pages_pct and innodb_io_capacity; but the limitingÂ factor is stillÂ innodb_log_file_size. To prove it, I took Percona Server based on 5.5.8 and ran it in MySQL mode (that is, using adaptive_flushing from InnoDB and with the adaptive_checkpoint algorithm disabled), but with giant log files. I used a log file ofÂ 8000MB*2, just to see what the maximum checkpoint age is. Success! With a big log file, we are getting stable throughput. 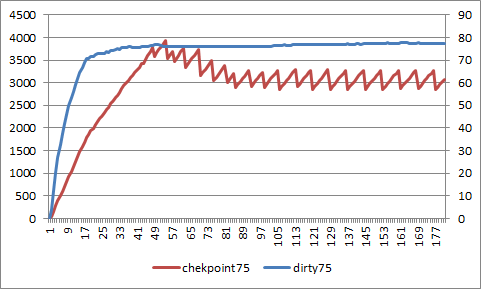 Checkpoint age jumps up to 3900MB line, but the dirty page percentage is not kept within the 60% line, going instead up to the 70% line limit. That is, to get this stable throughput, we need a total log file size ofÂ about 3900MB + 25% = 5300MB. The 15-minute average result for this test is 48983 NOTPM. But what about innodb_max_dirty_pages_pct; can we get better results if we increase it? It’s not respected anyway. Let’s try the previous run, but with innodb_max_dirty_pages_pct=75. about 9000MB of log space. The 15-minute average result for this test is 55073.06 NOTPM. What can be the reason? Let’s try a guess: flushing neighborhood pages. Let’s repeat the last run, but with innodb_flush_neighbor_pages=0. Okay, we are back to a stable level. 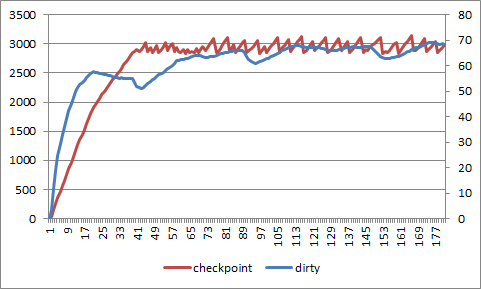 Checkpoint age is also back to 3000MB, and dirty pages are stable as well, but getting to 77%. I am not sure why it isÂ more thanÂ 75%. It is a point for further research, but you are probably tired from all these graphs,Â as am I. The 15-minute average result for this test is 52679.93 NOTPM. This is 1.4x better than we have with the stable line in MySQL 5.5.8. 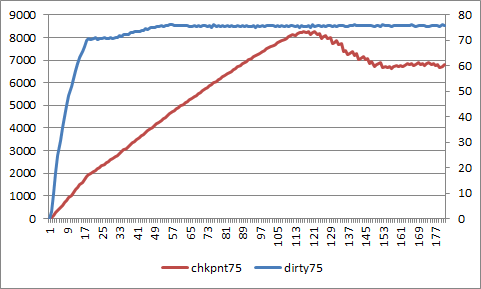 The 15-minute average result is 73529.73 NOTPM. 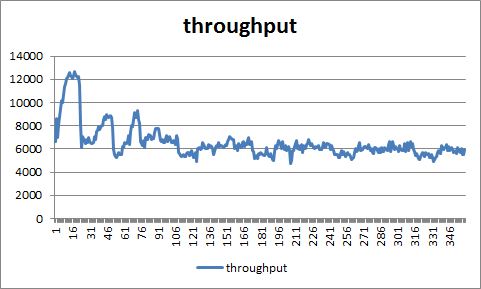 The throughput is about 1.33x better than in “MySQL compatible mode”, though it requires 10500MB for checkpoint age; that is, 14000MB of log space. And, the Percona Server result is ~2x better than the best result I received with MySQL 5.5.8 (with innodb_doublewrite enabled). In summary, my conclusion is: You can try to get stable throughput in MySQL 5.5.8Â by playing with innodb_max_dirty_pages_pct and innodb_io_capacityÂ and having innodb_doublewrite enabled. But you must have theÂ support of big log files (>4GB)Â to help increase throughput. 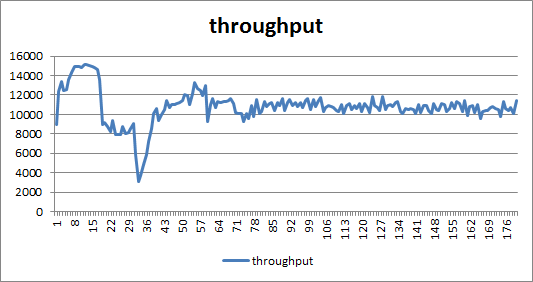 Basically, by lowering innodb_max_dirty_pages_pct, you are killing your throughput. When you disable innodb_doublewrite, you can get stable throughput if you are lucky enough to find a magic innodb_max_dirty_pages_pct value. 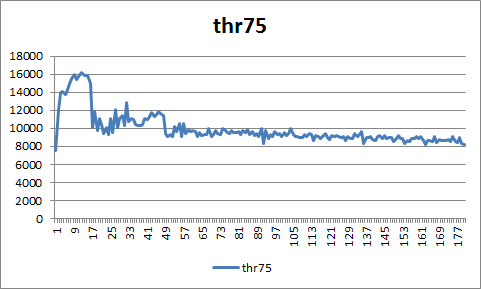 As you saw in theÂ results above, 50 and 70 are not good enough, and only 60 gives stable throughput. Great analyzes ! I would mention one more thing here – tuning is hard and expensive and if we can get the system to self balance it is best. I think parameters as innodb_max_dirty_pages_pct and innodb_io_capacity is something which should not be explicitly set but system should be able to balance itself to get a best stable performance. Now while we’re playing with benchmarks we need to understand this is only a game and real production systems do not stable workload in most cases. The number of users, types of transactions they run, batch scripts which are started in background always change the system and the optimal values will depend on the workload a lot and so be likely very different. I do the same tpc-c test, and the result is close to yours. Could you offer a link to the raw test data? I wish to compare several groups of test data in one gragh. Thanks a lot. regarding doublewrite: I’ll test this case to see the impact.. – “normally” there should be near no impact on SSD storage.. – but let’s see..
regarding redolog size: I’m still not sure there is any “limit” coming due 4G redo logs.. – well, for sure, having 1TB redo logs and say 512GB buffer pool you may run on fly for hours and still just keeping a minimal writes – only redo log sequential writes, and you’ll have the fastest possible performance! – however while having a highly performant storage there should be not too much difference if you’re writing 20MB/s or 200MB/s in background..
also interesting that flushing of neighbor pages was several times tested in the past and was still not accepted as performance was worse with it..
Well, I still have yet more questions than answers.. Note that step #5 is done even when O_DIRECT is used. See http://bugs.mysql.com/bug.php?id=45892. This is fixed in the Facebook patch. I also have results at http://mysqlha.blogspot.com/2009/06/buffered-versus-direct-io-for-innodb.html to show that the bogus fsync hurts performance. And that one large write is likely to use a small number of disks given a reasonable RAID stripe. The other disks won’t be doing any writes at that time. the solution (workaround) I’ve found in the past for doublewrite buffer was to move it into a separate storage/disk (http://dimitrik.free.fr/blog/archives/2009/09/mysql-performance-io-optimization-innodb.html) – in this case you don’t mix its fast seq.writes with other I/O operations (specially random reads).. However seems the things are more complicated now.. – hope to post some results soon. I agree with Peter. I think the goal should be a system that balances itself against the resources available to it, not over-committing to do some work that the hardware is not capable of doing. Database administrators shouldn’t have to set a complex mixture of two or three tuning parameters to exactly the right magic values for good performance. It’s impossible to do, because the workload is going to vary. The database needs to adjust as the workload varies. Configuration parameters that are set at a certain value can’t adjust with a changing workload. If there were a real-world application that ran something like the workload in these tests, but with real users driving it and things like backups and cron jobs running every now and then, we’d see stable performance at some times of the day, and wild oscillations at other times. That’s just not good enough. My writes are fast courtesy of HW RAID. They just aren’t fast enough and add latency. On a system with too much pressure on the buffer pool threads that run user transactions pause to schedule writes for dirty pages at the end of the free list and those writes suffer from the latency added by the doublewrite buffer write. This would be less of a problem if the main background thread did that work. Yes I agree with you. We should have found the combination offering best performance for MySQL 5.5.8 for given workload. 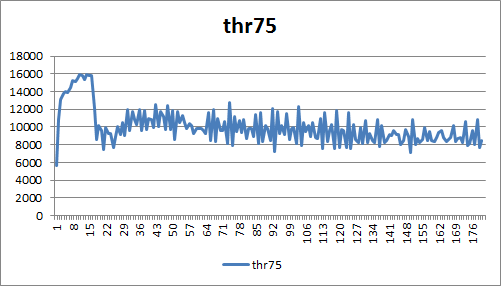 At the same time if it requires “fine tuning” to get these numbers it is a downside as it is not always possible to achieve such tuning.